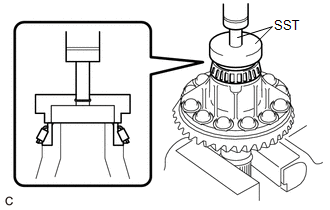 (a) Using SST and a press, press the transfer driven pinion rear bearing (outer race) to the case. Keep the transfer case horizontal using wooden blocks, etc. 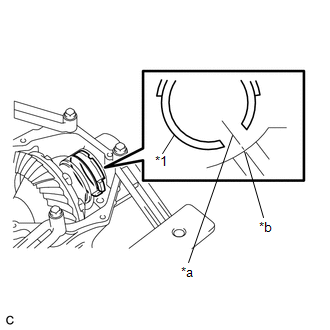 (b) Apply gear oil to the transfer driven pinion rear bearing (outer race). 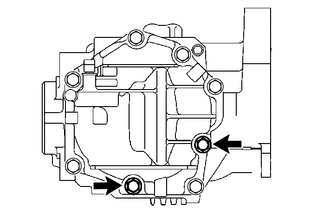 (a) Install the transfer output shaft washer to the transfer case. Install the same washer as the one removed. (b) Apply gear oil to the transfer output shaft washer. 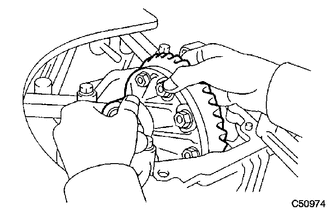 (a) Apply gear oil to the inner surface of the transfer case. 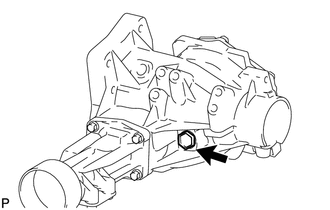 (b) Using SST, install the transfer driven pinion front bearing (outer race) to the transfer case. 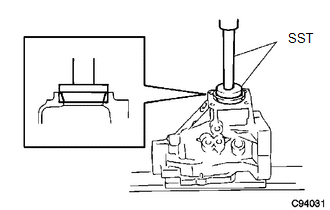 (c) Using SST and a press, press the transfer driven pinion front bearing (inner race) into the driven pinion. 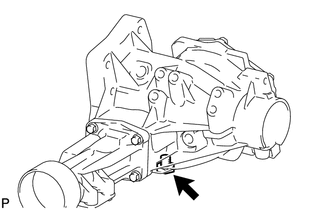 (a) Install the driven pinion to the transfer case. 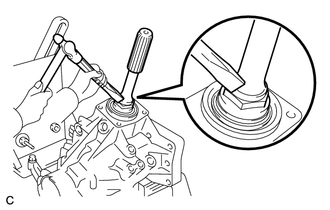 (b) Install a new transfer pinion bearing spacer and driven pinion rear bearing (inner race) to the driven pinion. 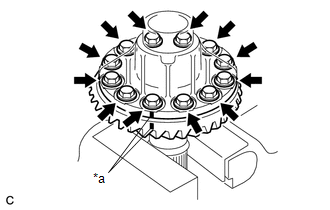 Install the pinion bearing spacer with the larger inner diameter facing forward as shown in the illustration. 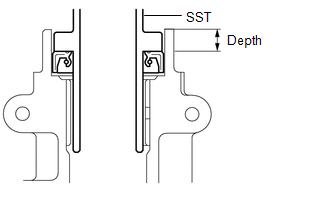 (c) Using SST, install a new gear nut. Do not stake the gear nut until the final preload, tooth contact and backlash adjustments are completed. 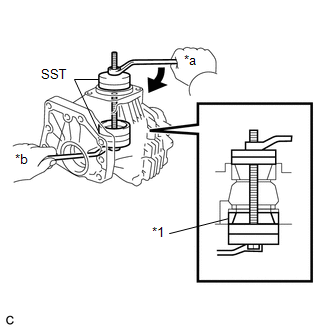 (a) Using SST and a torque wrench, measure the driven pinion preload. If the preload is more than the specification, replace the transfer pinion bearing spacer with a new one. If the preload is not sufficient, adjust the driven pinion by tightening the gear nut 5° to 10° and measuring the preload until the preload is within the specification. Even if the tightening torque of the gear nut exceeds the specified torque, if the preload is insufficient, loosen the gear nut once and apply rust preventive oil or hypoid gear oil to the gear nut and to the screw or bearing surface of the driven pinion. Then perform the procedure again. If the tightening torque is less than the specified torque, replace the transfer pinion bearing spacer with a new one and adjust it. Do not loosen the gear nut to reduce the preload. (a) Clean the contact surfaces of the ring gear and transfer ring gear mounting case. (b) Heat the ring gear in boiling water. 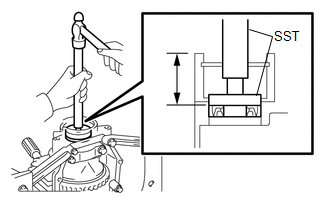 (c) Carefully remove the ring gear from the boiling water. (d) Secure the transfer ring gear mounting case in a vise using aluminum plates. Be careful not to damage the transfer ring gear mounting case in the vise. (e) After the moisture on the ring gear has completely evaporated, quickly align the matchmarks and set the ring gear to the transfer ring gear mounting case. (f) Apply adhesive to the 12 new bolts. (g) Install the 12 bolts. Tighten the bolts evenly in a diagonal pattern using several steps. Tighten the bolts after the ring gear has cooled down sufficiently. In order to ensure proper sealing of the bolts, apply adhesive to the bolts and install them within 10 minutes of adhesive application. 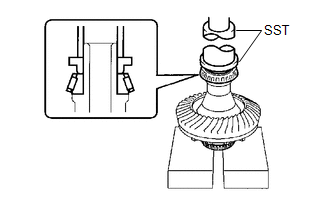 (a) Using SST and a press, press the ring gear mounting case bearing (inner race) to the transfer ring gear mounting case. (b) Install the ring gear mounting case bearing (outer race) to the transfer ring gear mounting case. (c) Apply gear oil to the ring gear mounting case bearing. 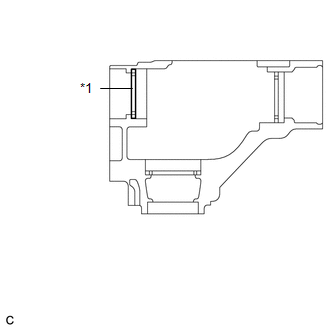 (d) Using SST and a press, press the ring gear mounting case bearing (inner race) to the transfer ring gear mounting case. (e) Install the ring gear mounting case plate washer to the case. If replacing the case plate washer, use one with the same thickness as the one removed. 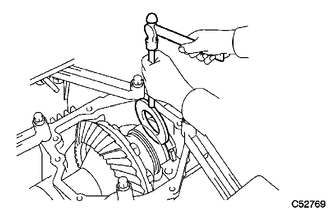 (f) Using SST and a press, press the ring gear mounting case bearing (outer race) to the transfer case. (g) Apply gear oil to the ring gear mounting case bearing. (a) Apply gear oil to the transfer ring gear mounting case. 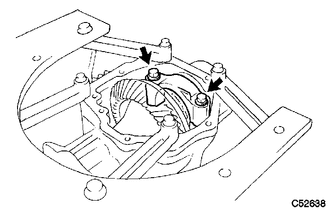 (b) Install the transfer ring gear mounting case to the transfer case. (a) Align the cutout on the No. 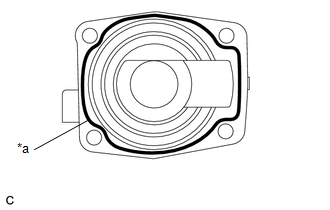 1 transfer output shaft spacer with the transfer case hole to install it as shown in the illustration. (a) Using a brass bar and a hammer, install the No. 2 transfer ring gear mounting case washer. Use a No. 2 transfer ring gear mounting case washer with the same thickness as the one removed. 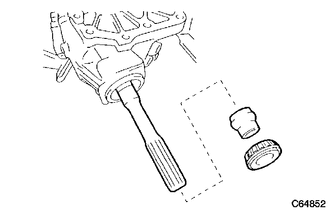 (a) Install the bearing cap with the 2 bolts. (a) Set a dial indicator perpendicular to a ring gear tooth tip. Secure the driven pinion in place and move the ring gear back and forth to measure the backlash. Check at least 3 positions on the circumference of the ring gear. 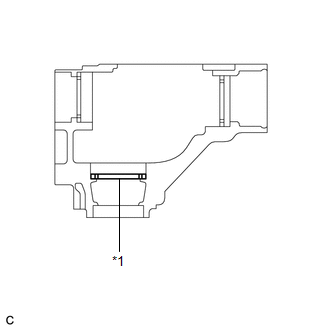 (b) If the backlash is outside the specified range, select a ring gear mounting case washer from the table and install it to meet the specified range. (a) Coat 3 or 4 teeth at 4 different positions on the ring gear with Prussian blue. (b) Rotate the ring gear 10 times or more. 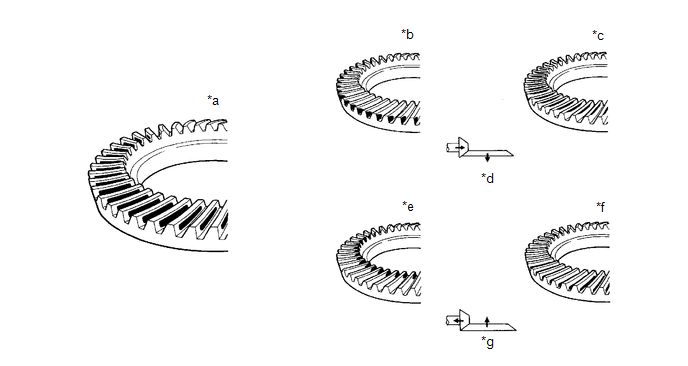 (c) Rotate the ring gear to inspect the tooth contact pattern. (d) If the tooth contact pattern is not correct, select a new transfer output shaft washer that is thicker or thinner as necessary and recheck. When the washer thickness is changed, readjust the backlash (See page ). 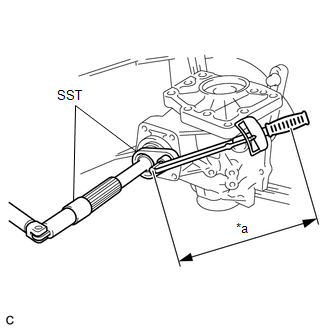 (a) Using SST and a torque wrench, measure the total preload. 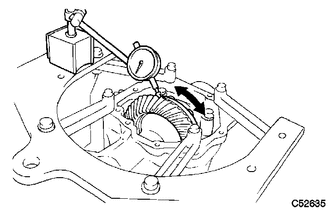 Turn the driven pinion counterclockwise and clockwise several times. If the preload is outside the specified range, replace the No. 2 transfer ring gear mounting case washer with one that is thicker or thinner as necessary and recheck. (b) Using a chisel and a hammer, stake the gear nut. 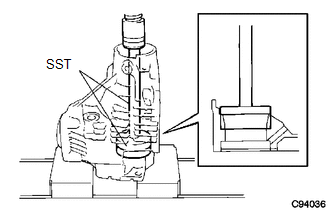 (a) Using SST and a hammer, drive a new transfer case front oil seal into the case until it reaches the position shown in the illustration. 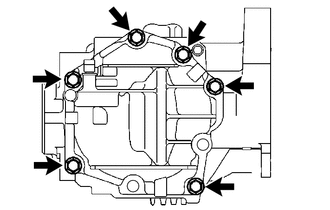 Make sure that the transfer case front oil seal is not tilted. 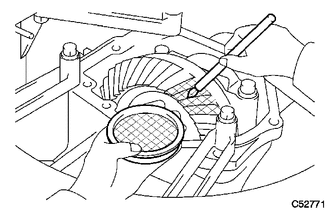 (b) Apply a small amount of MP grease to the lip of the transfer case front oil seal. 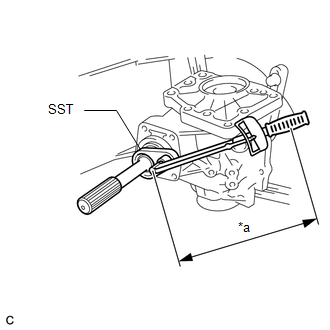 (a) Using SST and a hammer, drive a new transfer case front oil seal into the transfer case until it reaches the position in the illustration. 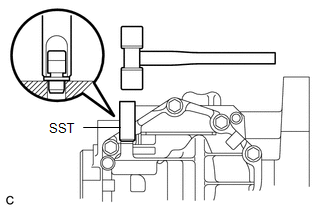 (a) Using SST and a hammer, drive a new transfer case rear oil seal into the extension housing until it reaches the position shown in the illustration. 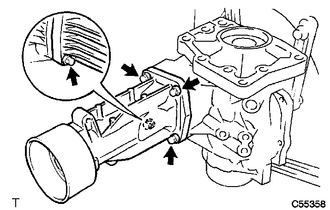 (b) Apply a small amount of MP grease to the lip of the transfer case rear oil seal. 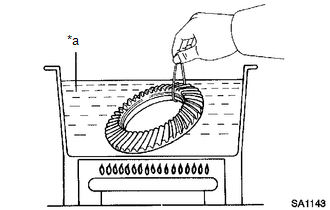 (a) Using SST and a press, press in a new transfer extension housing dust deflector until it contacts the installation surface as shown in the illustration. 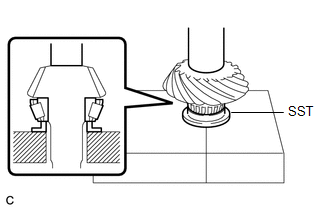 (a) Remove any FIPG material and be careful not to drop oil on the contact surfaces of the transfer extension housing sub-assembly and the transfer case. (b) Degrease the surfaces with a non-residue solvent. 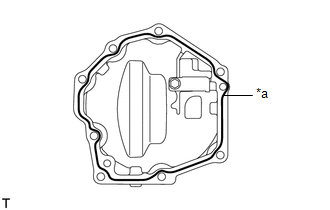 (c) Apply FIPG to the transfer extension housing sub-assembly. 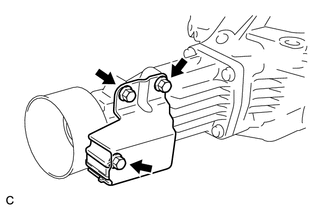 (d) Install the transfer extension housing sub-assembly with the 4 bolts to the transfer case. Assemble the transfer extension housing sub-assembly within 10 minutes of FIPG application. (a) Remove the transfer assembly from the overhaul attachment. 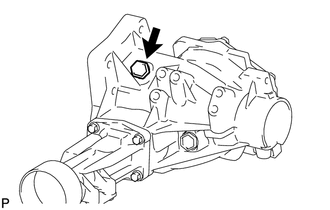 (a) Using a plastic hammer, drive the 4 transfer case straight pins into the transfer case positions shown in the illustration. 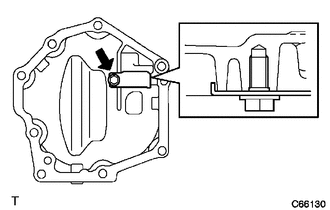 (a) Install the transfer dynamic damper with the 3 bolts to the transfer extension housing sub-assembly. (a) Using SST and a hammer, tap in a new transfer case breather plug. (a) Install the breather oil deflector with the bolt. (a) Remove any FIPG material and be careful not to drop oil on the contact surfaces of the No. 1 transfer case cover and the transfer case. (c) Apply FIPG to the No. 1 transfer case cover. (d) Install the No. 1 transfer case cover with the 6 bolts. Wait for at least one hour after installing the No. 1 transfer case cover before adding transfer oil. Assemble the No. 1 transfer case cover within 10 minutes of FIPG application. (e) Install the No. 1 transfer case cover with 2 new bolts. 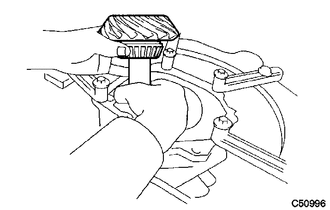 (a) Install a new gasket to the transfer drain plug. 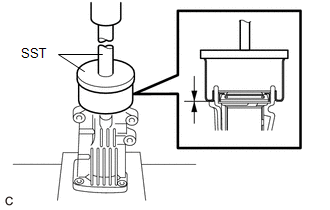 (b) Install the transfer drain plug to the transfer assembly. 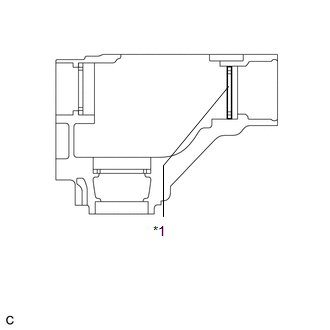 (a) Install a new gasket to the No. 1 transfer case plug. (b) Install the No. 1 transfer case plug to the transfer assembly. (a) Install a new gasket to the No. 2 transfer case plug. (b) Install the No. 2 transfer case plug to the transfer assembly. 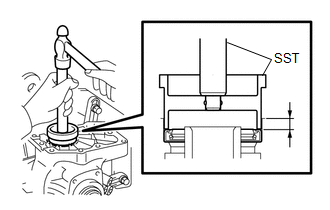 (a) Install 4 new transfer and transaxle setting stud bolts to the transfer case positions shown in the illustration. Install the shorter end of the stud bolts to the transfer assembly.